I was testing out a build that relies on Cluster Arrow with Loaded for Bear for low MP runs. It was swell and dandy until I run into a guy with the following affix: Reflect Damage, Ouch. Hitting a mob that has Reflect Damage on with a high burst damage skill is pretty painful for a Demon Hunter with low mitigation and relatively high DPS. ಠ_ಠ I’ll get trifecta gloves eventually! I switched back to the build that uses Elemental Arrow with Ball Lightning. As much as I loved watching things explode in a fiery ball, Cluster Arrow wasn’t as effective as I thought it would be with my play style mainly because I’m incredibly reckless and I kept killing myself on Reflect mobs. I would always have to desperately run around looking for health globes after firing off Cluster Arrows. Sure, there were TONS of health globes lying around earlier, but they were never there when I truly need them. To resolve this issue, I just decided to make my own Health Globes. They’re good and good for you! 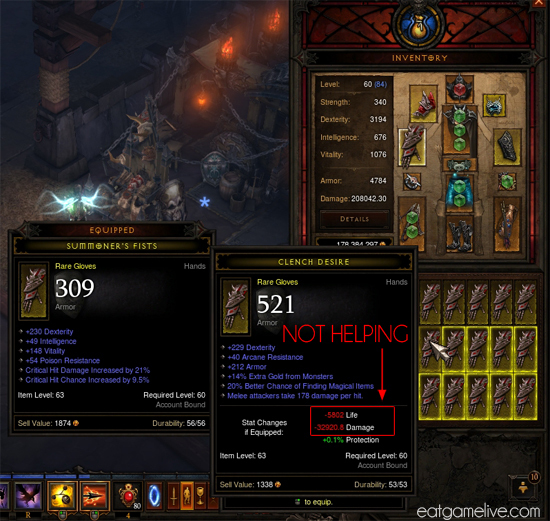 I mentioned this recipe briefly in my Q&A with Diablo III CM, Vaeflare (oh waaaat!?). More details on that later. It’s time to cook! I will note that you might have a little extra filling left over! Slice the tops off of your tomatoes. Carefully hollow out the insides of the tomatoes using a spoon. Make sure you get rid of most of the seeds. Salt the insides of the tomatoes and place paper towels or napkins inside of the hollowed tomato. Flip tomatoes upside down and allow the tomatoes to drain for about 20 minutes. During this time, prep the rest of your ingredients. Set a pot with 1 cup of water to boil. 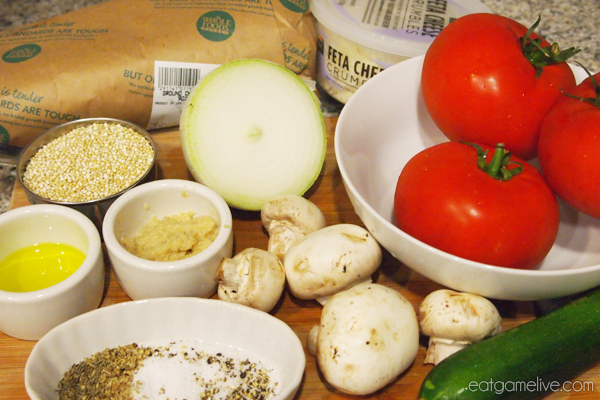 Thoroughly rinse your quinoa and cook as recommended by the packaging (a little under 15 minutes or so). Season the quinoa with salt. Stir occasionally. Set a skillet on high heat and add in 1/2 tablespoons of olive oil. When the skillet becomes hot, saute your chopped vegetables. Season with half of your salt, pepper, oregano, thyme, and minced garlic. Cook for about 5 minutes. Add the remainder of your olive oil to the skillet. Add in your ground chicken breast and season with the rest of the salt, pepper, oregano, thyme, and minced garlic. Cook until browned (~7 minutes). When quinoa is done, add in the cooked ground chicken and vegetables. Combine thoroughly. 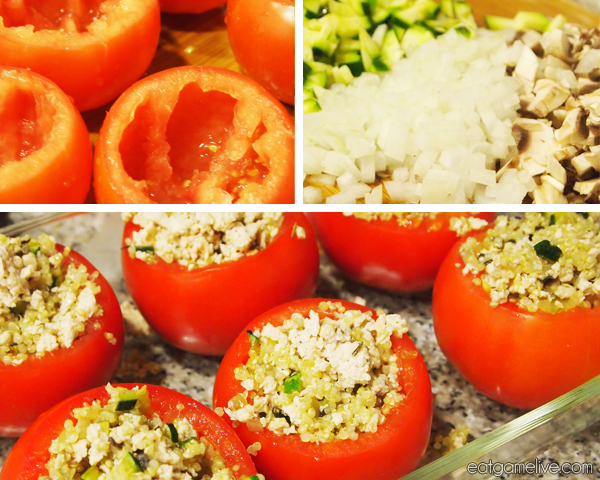 Remove paper towels from tomatoes and begin stuffing each tomato with the quinoa filling. 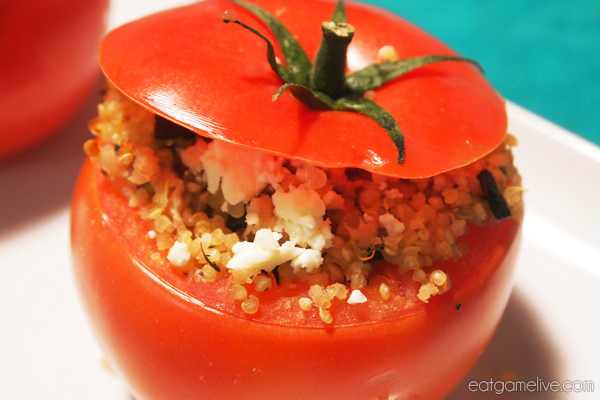 OPTIONAL: Add feta cheese on top of each tomato. Place tomato tops back onto the tomatoes. Roast in the oven for about 25 minutes. Ta-da! That’s a GG WP for Healthy Globes, the healthier alternative to your standard health globes that pop out of demons (gross). This is clearly an unedited screenshot. Remember, don’t fight the baddies of hell on an empty stomach! That’s right, Eat Game Live is the Diablo III Fan Creation of the Week for March 22nd, 2013! Woohoo! Community Manager Vaeflare reached out to me and offered the amazing opportunity to have my blog posted to the Diablo III website. Of course I gladly accepted! You can read the full blog post and answers to my culinary questions on the official Diablo III Fan Creation of the Week blog. Basically, the team is awesome and I can’t thank them enough for putting up my blog. Yay! Basically, I’m being super smug about it right now since I’m getting so much mad nerd street cred. Congratulations for being posted in D3 site! Your foods are brilliant! I wish you could do a food version of Manajuma’s Gory fetch (without the feathers of course!) — since I love playing WD. A WD recipe is in the works and a recipe based off of Manajuma’s Gory Fetch is definitely a good idea! I’ll see what I can do. Thanks!